Throughout yesterday (Wednesday) Wicklow County Council responded to numerous incidents and calls for assistance across the county. Council Staff/Civil Defence were deployed to the Avoca River in Arklow in order to assist and provide support to the local residents/businesses etc. This entailed the provision of pumping equipment, sandbags etc. Some temporary road closures were necessary. Similarly Council Staff were on standby in Baltinglass arising from concerns in relation to the rising water levels in the River Slaney. Fortunately the recent flood protection works at this location prevented any overtopping of water. 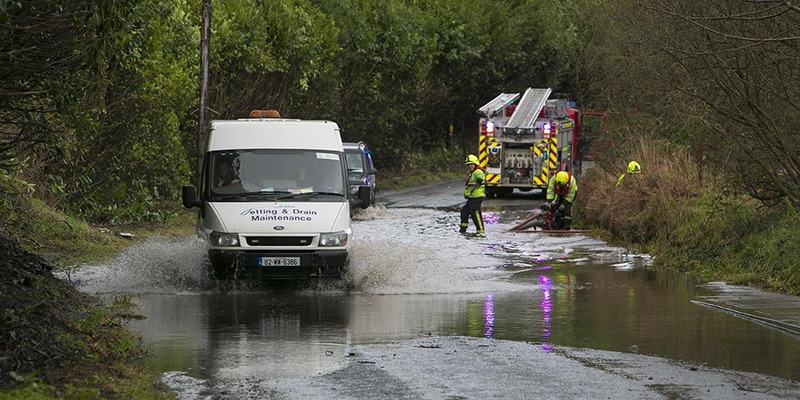 The Civil Defence/Fire Service were also busy pumping water away from flooded areas, providing sand bags and providing support and assistance as required. Currently river levels throughout the county are a cause of general concern to the Council. Earlier this morning Council Engineers met on site with Iarnród Eireann Technical Staff in relation to erosion at the Murrough, Wicklow. Iarnród Eireann has confirmed that they are monitoring the situation and are keeping the matter under constant review. Wicklow County Council has recently been allocated funding for Coastal Protection Works at this location which are scheduled to start at the end of January 2016. However arising from recent events it is envisaged that additional works may be required and in this regard the Council will continue to liaise with Iarnród Eireann. A breach in the lower walls on the River Dargle at the Peoples Park, in Bray has been temporarily repaired with an earthen embankment. This wall is due to be replaced within the next six months as part of the River Dargle Flood Protection Scheme. The Council continues to remain on full alert and is closely monitoring the weather forecast for the coming days. The Council will continue to communicate with the public via our website, text alert system and twitter.